Happy Birthday Cisco! 3/27/2014 | Travis the Warrior --- Kickin' Cancer! Thursday, 3/27, was our pup Cisco’s third birthday! In some ways, it is hard to believe that 3 years have gone by so fast while in other ways, it is hard to imagine life before him. Since the boys could talk, they always asked about having a dog. Over the years, we have had Hermie the Hermit Crab, Lizzy the Lizard, Pusher the Madagascar Hissing Cockroach and various other bugs and creatures. The thing is, all of these previous pets had one thing in common: mom takes care of them and keeps them alive while everyone else enjoys playing with them. So, we wanted to wait until the boys were old enough to help share in the responsibilities of taking care of a little family member like a dog. Then in early 2011, one of our neighbors adopted a rescue dog and after a few weeks, they started noticing changes in her. Low and behold, Lindy was pregnant with puppies and had a litter of 4. Since we had been talking about it anyways and he was so cute, how could we turn down that little thing? 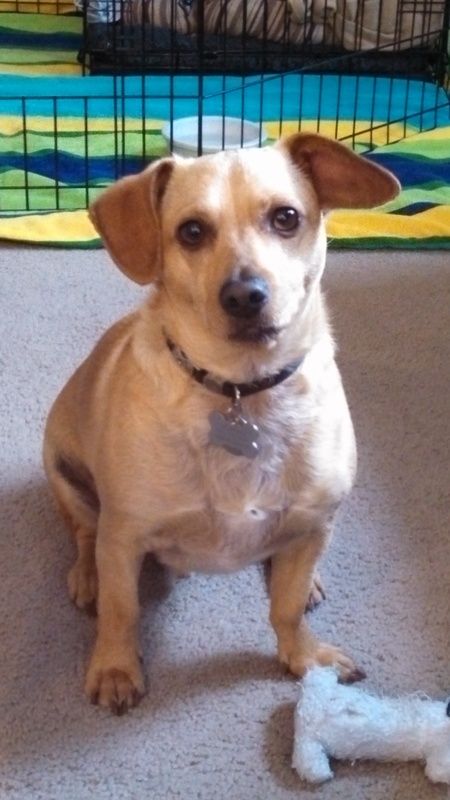 Luckily, 3 of the 4 puppies were adopted in our neighborhood and our life with Cisco began. Hey, Travis’ bed is pretty comfortable! Tyler, are you awake yet? Fast forward 2 years to early 2013 and little did we know how important Cisco would be to our family. Prior to Travis’ diagnosis, when he wasn’t feeling so good, Cisco was right there with him. Then with everything going on with hospital stays and traveling, we thought to ourselves, how are we going to manage taking care of Cisco? But, no matter what was going on or no matter how long we needed to be gone (whether for a few hours, a day or weeks), we always found a way to make things work. Who was always there to greet us with such excitement and positive energy? Our boy Cisco! Good to be home with our therapy dog! Going through all of the hospital visits, no matter how bad things may have been at the time, one positive thing we always looked forward to was the Pet visits. Whether it was pain, nausea, anxiety or pure exhaustion, as soon as the therapy dogs came in, it was like God was sending his personal angel in to change the situation, and it always worked. The day we brought Travis home from the hospital after surgery, Travis was worried that Cisco would jump all over him since they hadn’t seen each other in 10 days. But don’t you know, Cisco sensed the situation and just curled up with Travis on the couch and the two of them slept for hours. Then when we brought Travis home from Houston, Tyler had Cisco wait in the back yard and it was amazing to see the two of them reunite after 7 weeks. 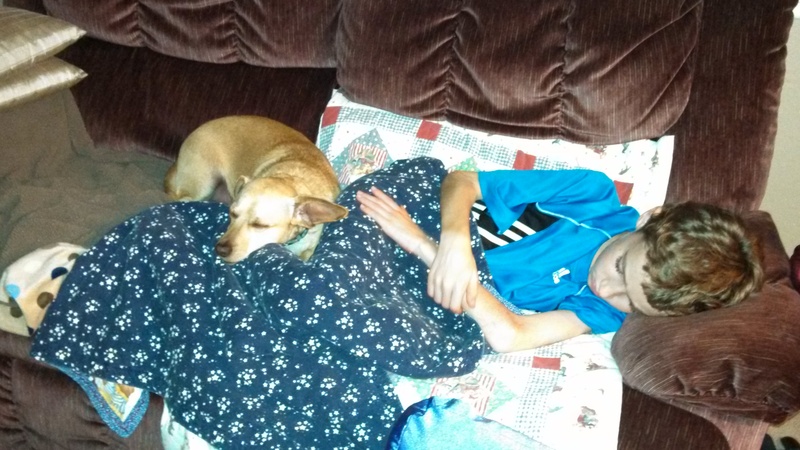 Cisco has truly been our “Therapy Dog,” not just for Travis but for our entire family. Happy birthday big boy! Oh…almost forgot, we received the results from Travis’ quarterly MRI he had on Tuesday and everything continues to look clear on the imaging. Yeah!!! Thank God for such great news!